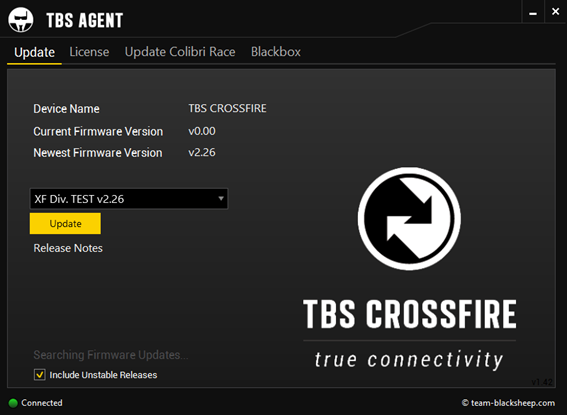 The TBS Crossfire updates his receivers wireless over the air. But sometimes this update can get interrupted and the receiver does no longer react to any bindings. Just in case this happend, there are several ways to get the receiver back to live. There is nothing extra that you need. Since FW 2.24 TBS has changed the boot loader completely. The Micro and Nano Rx stores the firmware inside and can flash itself just by the push of the button. Important: to use the self-update function you need to flash 2.24 (or newer) without any problems or interruption. The receiver will always install the latest (“golden”) firmware that has been flashed correctly. Right now (03/2018) it’s V2.24 – not the one you had installed before! 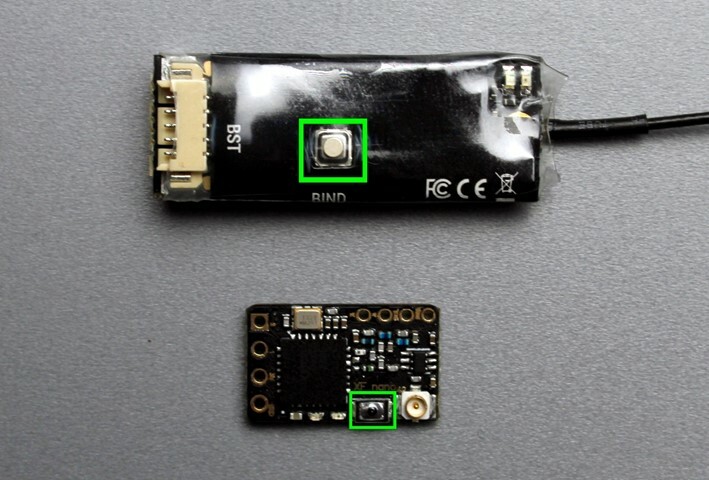 As the the diversity receiver got a USB connection you can flash it directly from the agent. Just hold the “Bind” button and connect it to the pc. In the Agent it will be discovered with FW 0.00 – just hit “Update” and the Agent will do the rest. 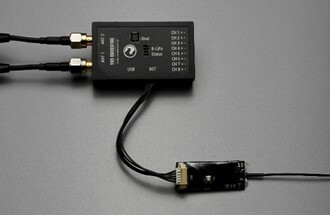 As the micro and nano receiver both ain’t got a USB connection you need a TBS Core Pro, TBS FPVision or a TBS Crossfire Diversity receiver in order to flash it. Just connect the receiver to the BST device via BST cable and hold the bind button (div. 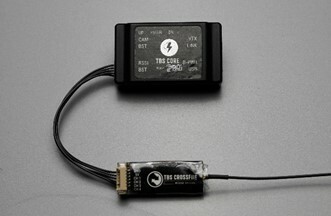 rx) or the menu button (core pro/ fpvision) while connecting the usb cable. 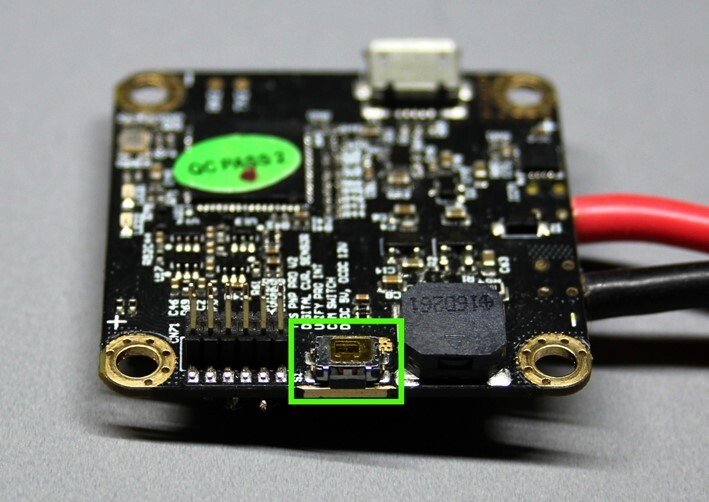 Important: only the Core Pro/ FPVision can provide voltage to the BST port. If you want to use a Diversity Rx you need to power the Micro/ Nano Rx separately. To get the receiver ready for the emergency Update you need start the Rx in boot loader mode. This means that you have to hold the “Bind” button while powering it up. You also need to start the BST “Master” device (Core/FPVision/ Diversity RX) the same way. On the Diversity Rx it’s the “Bind” button, on the Core Pro and the FPVision the “Menu” button. The receiver shows the boot loader mod with a fast flashing green led. If your Rx is already stuck in the boot loader mode, you don’t need to power it up and hold the “Bind” button. Now the Agent just shows the device which is directly connected to the pc – which is normal! When you hit the “Update” the Core/FPVision/ Diversity RX will be flashed first, then the update for the Micro/ Nano RX will start. Since 2.03 the Core/FPVision auto-detects if the BST -connected receiver is in boot loader mode. 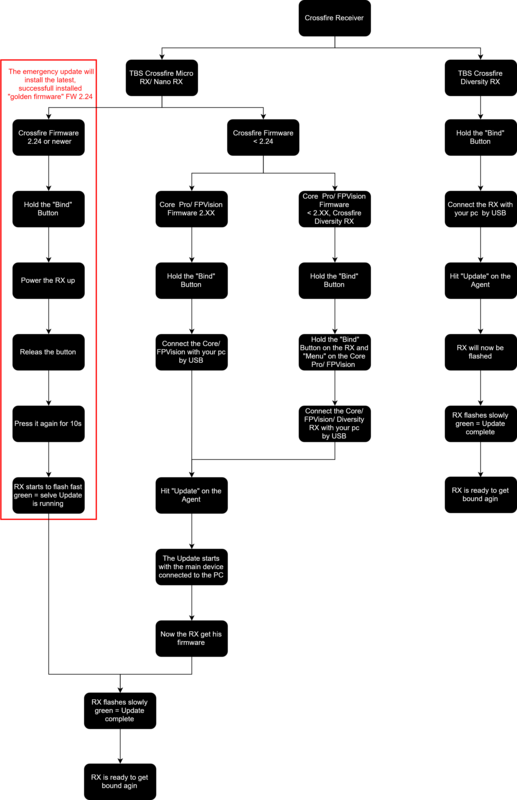 Therefore you don’t need to hold the “Menu” button – only on the receiver (linke before) to flash it. If you successfully flashed your receiver with 2.24 or newer your Rx got his own emergency update stored inside. To start the self-recovery you need to hold the “Bind” button while powering the receiver up. Now release the button for a second and press it again for 10s. The Receiver will start to flash fast green for a few seconds ( 10-15 sec in average). If he is finished the led starts flash slow again and you can bind him like before. But still shows its connected to agent. 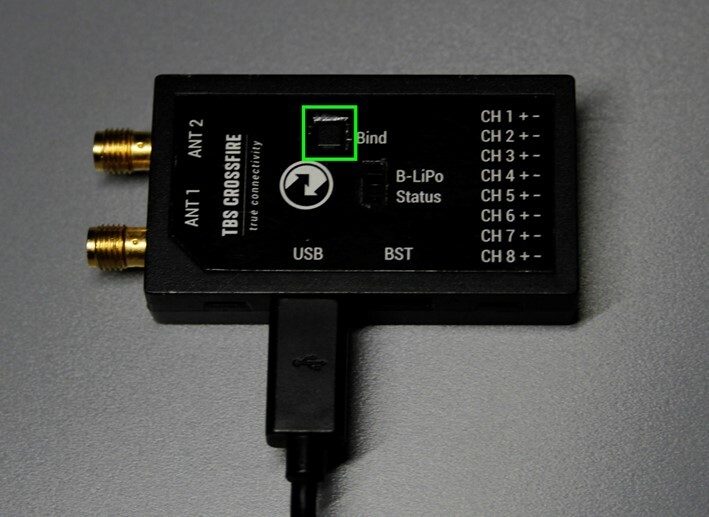 for the tx it´s pretty easy – just hold the button on the tx while plugin in the usb cable – this starts the tx in bootloader mode and it will be like after a reset when you finished the update. 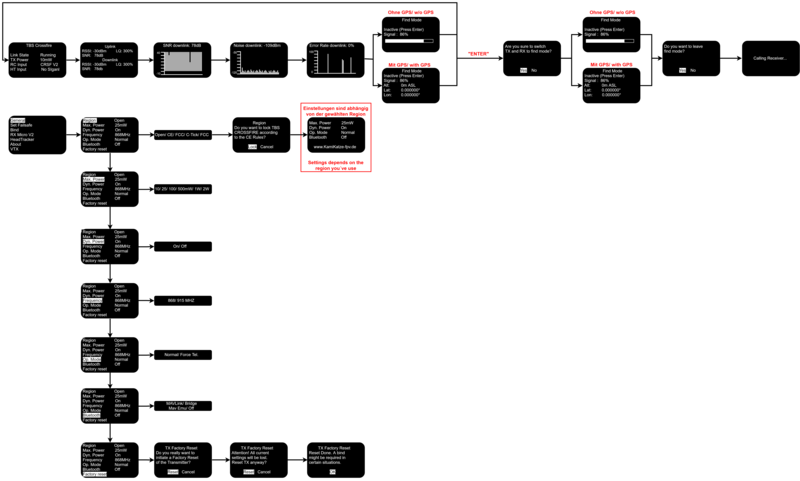 or – if you got a diversity rx or core pro/ fpvision you can run the “emergency update” for the receivers by the bst connection – this saves you the trouble with 1.6-2.4-actual firmware steps.